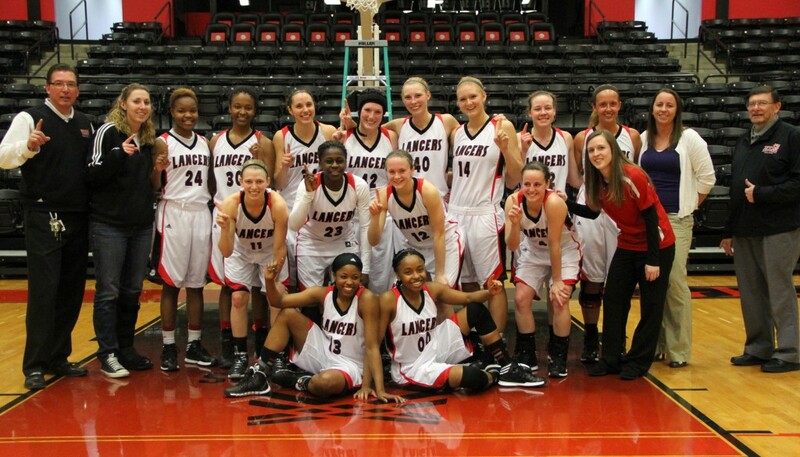 The Lady Lancers will enter next week’s NCCAA National Championships, held at Grace College, as the Midwest champ. The team’s first-round opponent will be released late Saturday night with the announcement of the official tournament field. Both Grace’s men’s and women’s teams will participate in NCCAA Nationals for the first time this year. The tournament is held from March 19-22. Juaneice Jackson dazzled her way to 22 points, 9 rebounds and 5 assists in 31 minutes of action. Allison Kauffman added 22 points and six boards. Grace led for all but 28 seconds of Thursday’s title game. A basket from Darian Patton gave Grace the lead for good at 4-3, and the Lady Lancers maintained a slight lead for the rest of the half. Jackson and Lindsey Schaefer scored quick baskets in the final minute of the half to lift Grace to a 39-33 halftime advantage. Kelsey Sule was a spark off the bench offensively, scoring seven points to help break down Oakland City’s 2-3 zone defense. The Lady Lancers opened the second half on a 27-13 run, pulling away from the Oaks. A basket from Micah Pollard lifted Grace to a 66-46 lead with 10:46 remaining. Oakland City made its strongest push of the game after Pollard’s shot, ripping off 12 points in less than two minutes to trim Grace’s cushion to eight points. But Grace retaliated with 10 unanswered points to effectively end the Oaks’ threat. Juaneice Jackson’s 22 points came on 10-of-18 shooting, and Allison Kauffman’s 22 points came on 10-of-14 shooting. Lindsey Schaefer pulled down a game-high 10 rebounds, and Chloe Pridgen tallied six points and six boards. Grace shot 49 percent from the floor while holding Oakland City to 33 percent. The Lady Lancers also dominated the rebounding battle, outrebounding the Oaks 54-23. This article first appeared on the Grace Sports Information page.